Unfortunately, this promotion has ended- More on the way! Hey everybody! I decided to do a second blog post about the Stressless Comfort Plus promotion that is going on until July 31st 2017. I am going to talk about the Swing table, as it is another perfect accessory to add style and convenience to your Stressless recliner. For example, when we are ready to relax in our recliners after a long Summer day, most of us like to enjoy a nice cold beverage. With the Swing table, you will have a convenient place to set your favorite drink of choice. Also, if you are like me, I like to have a place to set my remote (or is that remotes?) while I watch my favorite show. We all know that there is nothing worse than putting your remote down and not being able to find it later. During the current promotion, you can have your own Swing table completely free with any qualifying Ekornes recliner purchase. The versatility of the Swing table is fantastic and adds a unique flair of style to any Classic Stressless Recliner. Also, they come in your favorite Wood Stain color of choice, so you can match it perfectly to your beautiful new recliner. Now that I have focused on the versatility of the swing table, I would like to point out some key reasons why you should choose it as your free accessory during this promotion. The first reason is because it hardly takes up any space. Who has room for big, bulky tables anyway? The second reason to choose the Swing Table as your free accessory is that you intend to use your recliner for relaxing and don’t plan on using a laptop computer. If you expect to be using a laptop while relaxing in your recliner, then the Stressless Personal Laptop table, (described in the post below) should be perfect for you. The third reason to choose the Swing Table as your Free accessory is because it is interchangeable to whichever side of the chair is most convenient. This can be extremely useful, as many of us like to re-situate our furniture over the years, and the ability to switch the table to the other side can be very helpful. Since you have taken the time to read this Blog post, I would like to thank each and every one of you for your time. 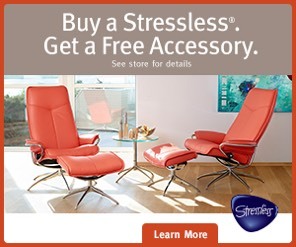 I know time is precious and I hope I was able to pass along useful information to help you make an educated decision on which Stressless accessory to choose during the Ekornes Free Accessory Promotion. Until next time my friends... Remember that true Relaxation is just a few clicks away!